7/2/2013–07/02/2013 12:00 AM–The 2013 NC Wing Summer Encampment has been a major success.It started off when staff members began arriving on Friday and began getting all the necessary equipment needed for the week. Communication User Training), classroom time for their ground team qualifications, First Aid, an EST (Engagement Skills Training), which is a weapon simulator connected to an air compressor. qualifications and an advanced compass class where they learned how to use the compass in a more advanced setting. attended the EST and had a great time learning how to properly handle a firearm. a field training exercise. 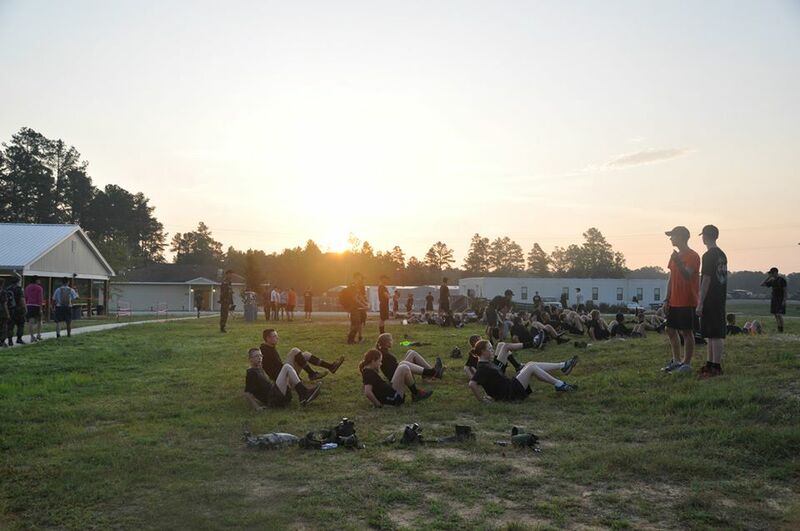 On these exercises the cadets put all the knowledge they learned into use as they completed 2 training missions in order to get their qualifications to become a ground team member. The Ground Teams have worked very hard this week and their achievements are well earned. The Aerospace Flight also worked very hard and took a total of 3 tests that are required for the Rocketry Badge. They built 3 rockets - 2 single stages and 1 double stage rocket - and fired them off on Thursday. While the vans were unloading an AH-64D Apache was about to take off. Although the cadets couldn’t get very close to the helicopter, it was very thrilling to watch, and all the Aerospace cadets enjoyed watching it take off and buzz the launch pads. The Aerospace Flights worked really hard and completed all the requirements for their rocketry badges. and it’s 3 main missions. Leadership flight worked extremely hard memorizing material, taking tests, learning drill, and gaining an overall knowledge of CAP and its role. ready to staff any encampment that’s thrown at them. learn about communications and have done exceptionally well. their qualifications and are now qualified Flight Line Marshallers. Great Job FLM, and it is well earned. Encampment,and thank you all for your hard work and dedication.